Tucson Daily Photo ~: Twins! Again! Well mama Dove loves my flower pot! She came back again to the same flower pot to make her spring nest and VOILA - she has twins again. It is just so amazing to watch the changing of the guard when mama stretches her wings for a little while and dad takes over to sit with the chicks. Today I got to watch her feeding this sweet little pair. They are learning to flap their wings - adorable! I have seen a dove before and she had little ones and I saw them fly away. Small wonderful world!!! 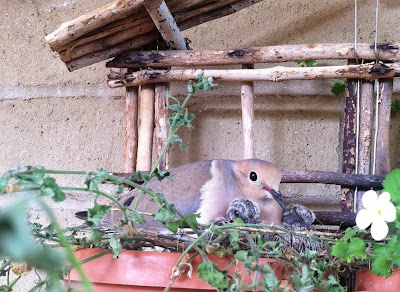 Your flower pot definitely has something that makes mama dove feel safe and protected. Great photo!